Three goals in the last 7 minutes were enough to secure victory for Queens against a spirited Alloa side who had fought back twice in the game and threatened to take the tie into extra-time. Injuries to three players forced Queens into making changes to the team that began at Dumbarton last week,as Dan Carmichael,Kevin Smith and Willie Gibson were replaced by Dan Orsi, Derek Lyle and Chris Mitchell with the latter making his competitive debut for Queens.Before kick-off, Stephen McKenna was presented with a memento to mark his 100th start for the club, and thankfully by the time the game began the worst of a very heavy thunderstorm had passed away from Palmerston. Queens boss Allan Johnston had promised that his team would play an attacking kind of football as often as they could, and that message certainly carried through to the players as they began in fine style. Just 2 minutes into the game the pace of Dan Orsi threatened the visitors backline, but the winger`s final ball lacked accuracy and the early chance came to nothing.Continuing to ask all the early questions, Queens went close from their first corner of the game when Chris Higgins met Mitchell`s perfect cross but the defender`s header went narrowly wide of the target. The early dominance from the home side was rewarded after 9 minutes when following a deep cross from the left, Clark`s header fell nicely for Chris Mitchell to calmly side foot the ball home from 10 yards out joining the band of players that have scored for Queens on their debuts. 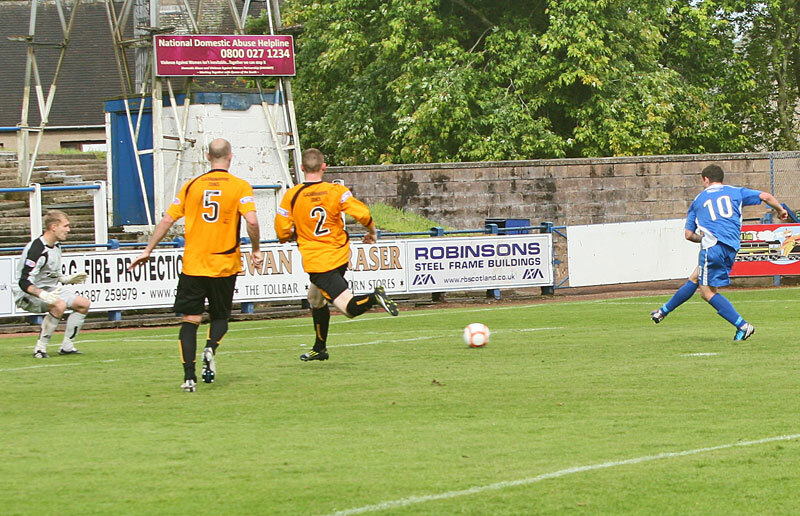 As Queens continued to attack, Clark forced Alloa `keeper Bain to make a fine diving save and from Mitchell`s left wing corner, Ryan McGuffie could have added a second goal with a better connection to his header. The visitors had hardly managed to reach the final third of the field but from a rare corner, former Queens man Stephen Simmons should have done better with a header. Queens had a great chance to double their lead on 24 minutes McGuffie`s driven cross from the right found Clark racing in at the near post but the striker was only able to turn the ball the wrong side of the upright. Moments later and from another dangerous Mitchell corner McGuffie saw his header stabbed clear for another corner and from Mitchell`s delivery this time it was Higgins who went close to scoring a second for Queens. The half ended with Queens well on top, and the only disappointing thing was that they had only managed to score once after creating a host of opportunities. In stark contrast to the begining of the match, the 2nd half kicked off in bright sunshine and the quiet opening minutes of the half showed no indication of what a bright and entertaining half of football lay ahead for the small crowd of just 967 fans. Seven minutes into the half, Lyle almost added a second for Queens but `keeper Bain reacted well to block his effort, and good work from Orsi gave him the chance to shoot , but again Bain was equal to his effort. The fact that Queens had failed to increase their lead, came back to hit them hard when on 64 minutes the visitors equalised. 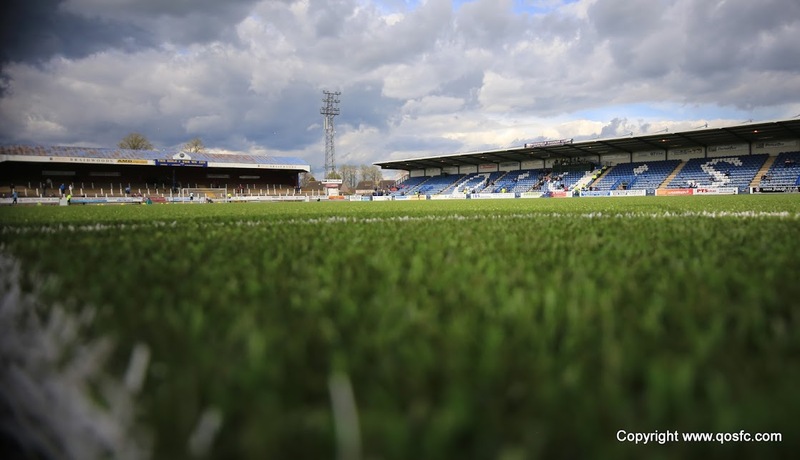 Queens were penalised for a rather soft looking foul, and McCord`s delivery was guided home with a well placed header by Gordon from 10 yards out. Whilst the goal was not entirely against the run of play, it did come as a bit of a shock to Queens but to their credit they continued to play some nice,neat attacking football, and Holt, Orsi and Clark combined well down the left to almost set up a chance for the lively Lyle, but the ball just broke away from the Queens striker at the vital moment. 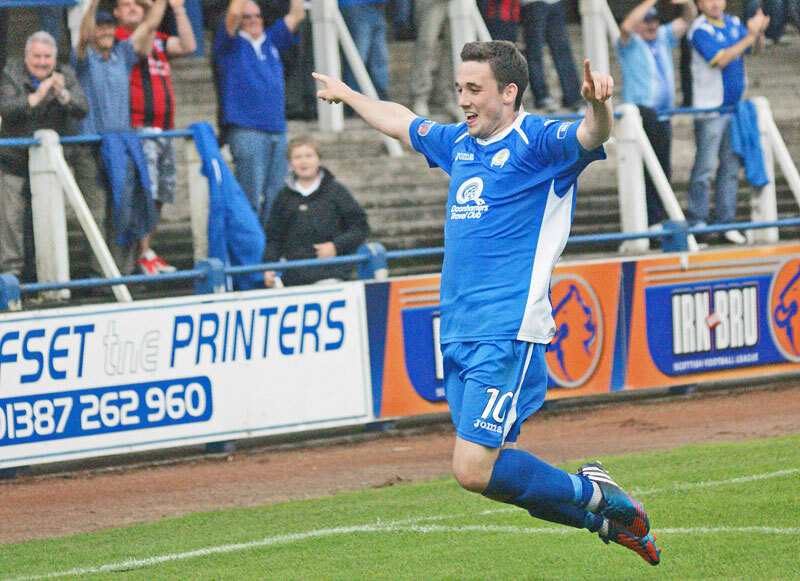 However, the second Queens goal was not far away, and on 67 minutes captain Chris Higgins rose unchallenged to place a bullet header inside the near post from Mitchell`s perfectly delivered corner kick.Derek Lyle almost marked his return to Palmerston as a Queens player with a goal after pouncing on a poor back pass but he was not quite able to direct his effort on target.Moments later Queens were appealing for a penalty after Orsi appeared to be hauled down inside the box, but the referee ignored the appeals and waved play on. Once again Queens failure to capitalise on their many chances was punished by the visitors when they equalised after 77 minutes with a clinical counter attack goal moving from one end of the pitch to the other in the blink of an eye with Grehan`s smart headed finish sealing the move. At 2-2 the game was in the balance, and for all their dominance Queens still had work to do. Dan Orsi created a chance for himself, cutting inside and shooting from distance, but his aim was off and the opportunity had gone. With time ticking by and the prospect of extra-time looming, on 83 minutes Queens went ahead for the third time in the game. A long ball from the back found it`s way to Clark some 30 yards out and the striker raced forward with the ball before calmly placing his shot past the diving `keeper to net his second goal of the season. Two minutes later Queens scored again, Orsi and Lyle combined well and Lyle`s neat square pass gave Clark the easiest of chances, side footing home from 6 yards out. Then in the dying moments of the game Queens made it 5 when Lyle was on hand to wrap up a fine performance by tapping home from close range. Queens ease through in the cup. 14:57 Stephen McKenna picks up his award for 100 Queens starts today. 15:02 We`re off! Rain hammering down..
1 min Interesting clash today between Derek Young and his twin Darren in the middle of the park! 2 min Correction on what we said earlier, it looks like a 4-4-2 after all..
11 min Alloa`s first corner creates good opportunity, but it`s fired over. 49 min My goodness, the Young household must have been an interesting place in the boys younger days.. quite a few tasty tackles! 51 min Bain blocks on the line after Clark pounced on a corner! 69 min Lyle pounced on a wayward backpass there and was inches from making it three. 71 min That`s not a typo.. it`s his twin brother! 74 min Lovely, lovely attack by Clark. Beat the defender, but the `keeper was there to block his shot. 74 min Moments later, Clark is hauled down in the box. Big penalty claim! 75 min Paul Hartley is getting a talking to. 76 min The linesman is copping stick from even the home fans for that..
88 min CORRECTION Reilly for Clark. 89 min Queens really should have done this earlier. 90 min Queens really should have done this earlier. 16:51 Queens are the only D&G side to progress. 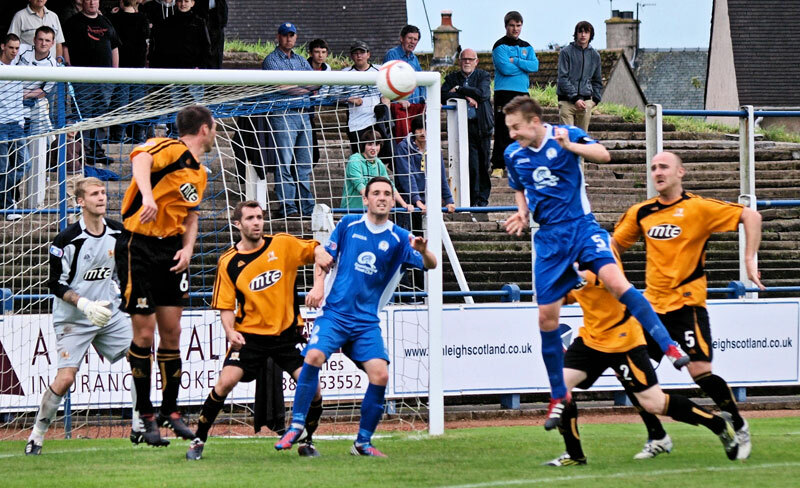 Annan lost out 2-0 at Hamilton, while Stranraer suffered an 8-0 thumping from Livi.